Betzest No Deposit Free Bet: get €/$5 bonus for betting and casino! Betzest is the fresh name in the online gambling industry and this new betting site aims to become Europe’s leading bookmaker! The welcome bonus exclusive to BetAndSkill readers is unmissable.. Get the taste of Betzest with $/€5 free no deposit required and 100% deposit bonus up to €/$50 for sportsbetting or €/$200 for casino!. No matter if you are playing on a personal computer, tablet or smartphone, you will be eligible to take advantage of the Betzest amazing offer! €/$5 just to join the Betzest family! 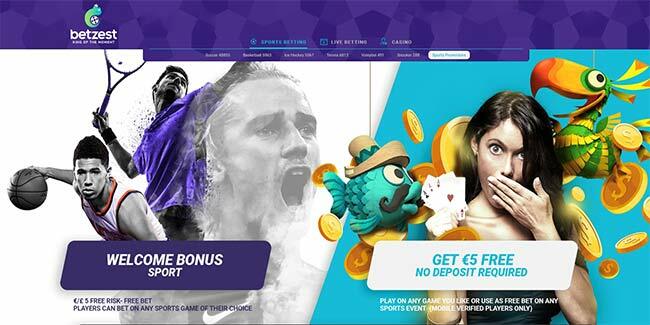 Betzest's no deposit bonus can be used both on sportsbook and casino. The wagering requirements for Sportsbook bonus has to be wagered 15x at minimum odds of 2.0 or higher while there is a 45x wagering requirement in casino before you can withdraw your winnings. Are you looking for bonuses with no wagering requirements? Betzest is rewarding BetAndSkill readers with wager-free spins in their top-notch online casino! 18+. New customers only. $/€5 no deposit bonus for mobile verified customers only. Minimum deposit $/€10. Maximum bonus $/€50. Wagering requirements on winnings from bonus x15. Full T&Cs apply. HOW CAN I GET A NO DEPOSIT BONUS AT BETZEST? Register an account with Betzest and get $/€5 No deposit required. Make a deposit and get a 100% bonus up to €/$50 instantly credited to your account (€/$200 if you choose the casino bonus). Betzest accept customers from all the countries in the world except USA, Netherlands, France and the regulated markets such as UK, Belgium, Denmark, Romania, Portugal, Italy, etc..
Betzest is licensed and regulated by the Malta Gaming Authority (MGA) and will be also licensed in the United Kingdom in the second half of 2018. They are ready to take the gaming industry by storm as project has been developed by a team of experienced professionals with years of experience in the market. Betzest uses the Sportingtech platform which offers an incredibly powerful sportsbook, mobile sportsbook and live betting software. Betzest support operates 24/7 in many languages such as English, Swedish, Finnish and Norwegian. It supports the major payment methods including credit and debit cards, e-wallets and pre-paid cards. Free bonus funds are valid both on sportsbook and casino product. This promotion is only valid for customers that have verified their mobile phone number. If you do not verify your mobile phone number, your free bet will be forfeited. For the Free $/€ 5 No Deposit Bonus to be credited to the customer’s account the customer needs to contact a support representative through email only. The maximum Free $/€ 5 No Deposit Bonus or currency equivalent (50 SEK, 50 NOK, 5 US$, 20 BRL, 5 AUS$, 5 CAN$, 5 NZ$). The maximum amount that can be withdrawn from the Free Bonus Money offer is €10. The Bonus amount and winnings have a wagering requirement of 50x Bonus which needs to be completed within 14 days of the Bonus being activated. Full Terms & Conditions at Betzest site. Free Bets No Deposit - Get Your No Deposit Bonus NOW! Sporting Index £100 free to get you started! No deposit needed! "Betzest No Deposit Free Bet: get €/$5 bonus for betting and casino!"